Speaking of music obviously everyone want to listen to their favorite musics in a good quality. Your speaker plays a vital role at this. A good speaker isn’t always the one with a bigger design. In fact, there are many portable speakers that come with a super sound. The most prominent advantage of owning a portable speaker is that you can carry it anywhere, while traveling for instance. Some portable speakers even come in a waterproof design to allow you carry them in a wet place like beach, lake or waterfall. So, every time you want to have some fun with your friends by visiting that kind of places you don’t need to worry about your speaker from get broken. Here is the list of the best waterproof portable speakers. If you are currently in the pursuit of waterproof portable speaker for a beach party then LifeJacket iMW575 from Altec Lansing is one of the units you need to consider. I won’t say that this is the best but it obviously deserve your attention. Comes with a “Transformers” design, LifeJacket iMW575 is the perfect entertainment equipment for travel. You can use this waterproof portable speaker to deliver better and louder sound from your smartphone, whether it’s iPhone or Android-based smartphone. You can connect your smartphone with this portable speaker using Bluetooth in seconds and the party is ready. Altec Lansing iMW575 Life Jacket features two 2.5 inch drivers with Altec DSP Audio Enhancement technology for optimum music playback and APT-X for CD-quality wireless audio. Its battery can last upt to 16 hours. Another teammate for your beach party. 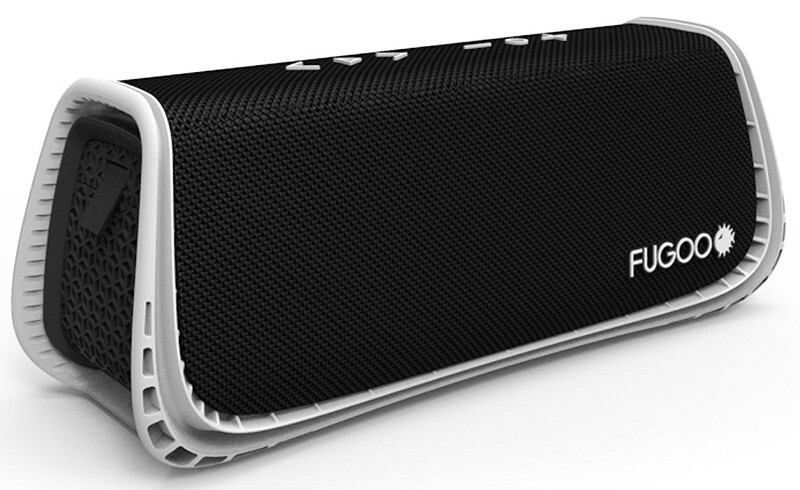 FUGOO Sport XL is waterproof portable speaker with the taste of home theater. Comes in an elegant design, this speaker features eight speakers, four neodymium tweeters, two aluminum domed neodymium woofers and two bass drivers. They will collaborate to deliver a better 360° of sound. 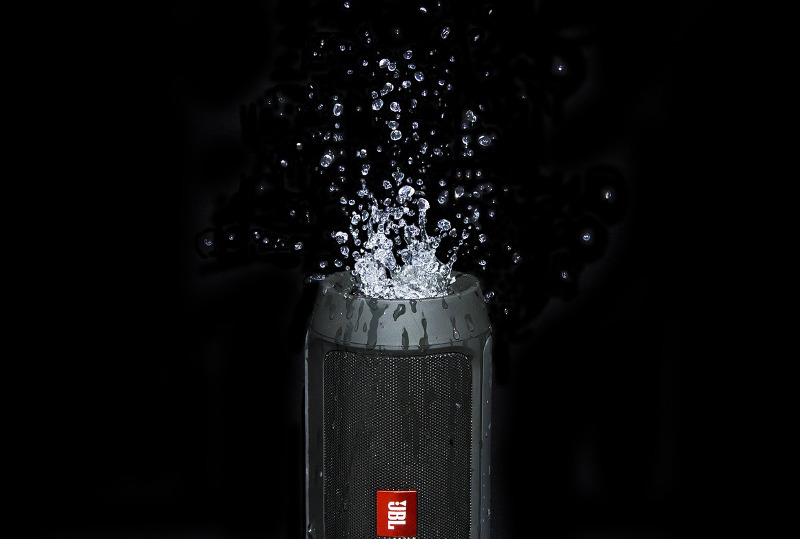 The waterproof feature of this speaker is pretty cool. You can take this speaker to swim up to 1 meter for about 30 minutes. Another good part about FUGOO Sport XL is its longer battery life. With only 3.5 hours charge time you can use this speaker for up to 35 hours!. FUGOO Sport XL is a versatile speaker. While you can put this speaker, you can also carry it around since it also features Portable Shoulder Strap XL, Hand Strap XL. If you are someone who love to hike and other outdoor activities and can’t get away from music, BRAVEN BRV-XXL would your perfect friend. 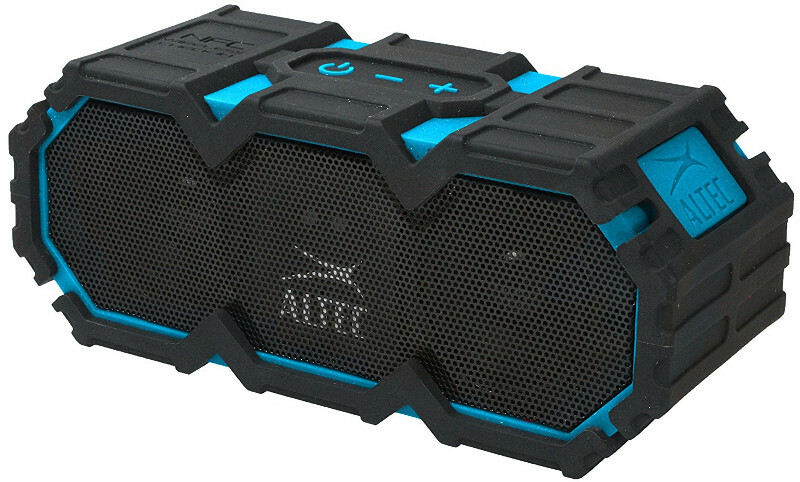 This portable speaker is designed specifically for outdoor enthusiasts like you. It is designed with an IPX7 certified waterproof body so you don’t have to so much worry about this your speaker when you want to visit a wet or moist places. When you get home, you can also use the speaker to play songs in your room since the speaker comes with dual audio modes. Optimized playback modes can be adjusted for indoor or outdoor listening environments. Outdoor mode provides bright, long-range audio, while indoor mode creates rich sound with deep, full bass. The battery of BRAVEN BRV-XXL can last up to 12 hours. One of the interesting features of this speaker is a built-in 5200mAh power bank which allows you to recharge your devices. Need a smaller waterproof portable speaker for mountain biking or rock climbing? SoundCore Sport from Anker would be a perfect companion. 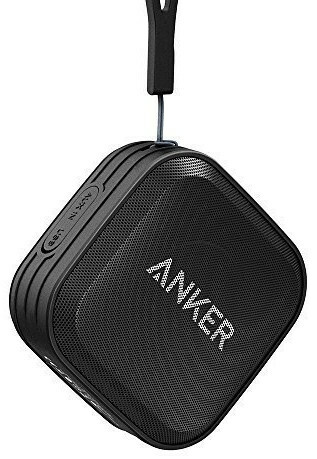 Same as BRAVEN BRV-XXL, Anker SoundCore Sport is also designed specifically for outdoor enthusiasts but it comes with a smaller design. With an IPX7 waterproof rating, this speaker can handle immersion in up to one meter of water for 30 minutes. Additionally, the speaker also features anti-clipping technology to ensure distortion-free music while its a 3W audio driver and passive subwoofer deliver crystal-clear sound quality and robust bass. Last but not least. 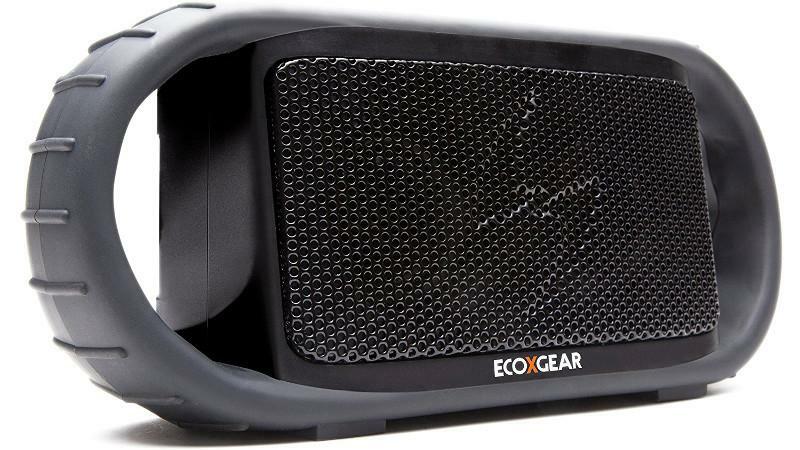 ECOXBT is another great waterproof portable speaker which you can use to accompany your outdoor activities. With the weight of less than 1kg this speaker is much easier to carry. You can stream music with your smartphone or other Bluetooth-enabled devices up to to 33-feet. The 100% waterproof acoustically engineered and sealed speaker enclosure provides a warm full sound with crisp highs and clear vocals via the dual full range integrated speakers. ECOXGEAR ECOXBT is available in 6 different colors. Disclosure: If you buy something featured here, we might earn an affiliate commission. Speakers are customized according to the preferences of the users. The several characteristics include ruggedness, portability, built in communication needs, compactness, loud output, bass and treble settings, and playback time duration.